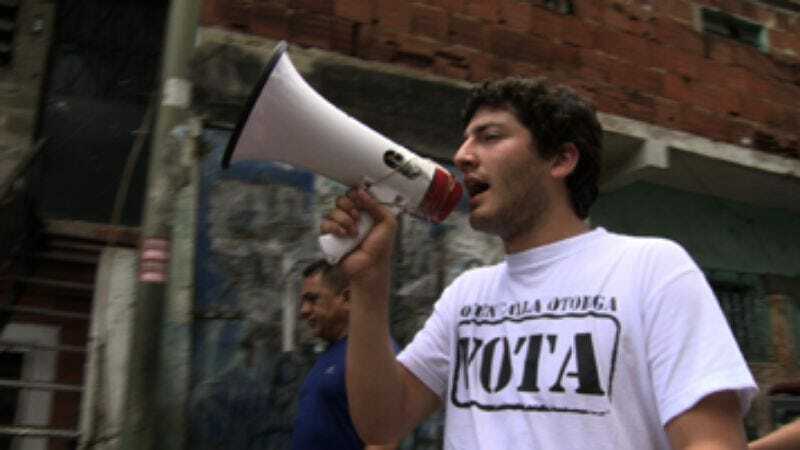 Interweaving brief histories of democratic uprisings around the world, Ben Moses’ documentary A Whisper To A Roar is more inspirational than informative, which is not to slight the importance of inspiring similar movements. That’s clearly the aim of Moses and executive producer (and “inspiration”) Larry Diamond, whose book The Spirit Of Democracy argues that, even in the face of troubled efforts like those in Iraq and Afghanistan, popular rule is a possibility for the world as a whole. Using news footage, animation, and new interviews conducted by Moroccan prince Moulay Hicham, who also financed the film, A Whisper To A Roar canvasses Ukraine’s Orange Revolution, the flowering of the Arab Spring in Egypt, the student movement opposing the consolidation of power by Venezuelan president Hugo Chavez, the protests against trumped-up charges levied against Malaysian opposition leader Anwar Ibrahim, and the successful challenge to the violent authoritarianism of Zimbabwe’s Robert Mugabe. The movements take many forms, some centered around a popular figure like Ukraine’s Viktor Yushchenko, who was poisoned with dioxin after he emerged as a threat to then-president Viktor Yanukovych, while others, like Egypt’s April 6 movement, arise from an explosion of popular outrage, sparked when troops loyal to president Hosni Mubarak fired on protestors in Cairo’s Tahrir Square. For ideological purposes, the film excludes pro-democracy movements closely tied to the U.S. or other foreign powers, so as not to muddy the agitprop waters. In the case of a less-publicized struggle like Malaysia’s, A Whisper To A Roar serves as a useful précis, but given the wide range of reporting in Egypt and Ukraine—the subjects of their own, less broadly focused documentaries—the usefulness of the film’s catchall approach comes seriously into question. The parallels between the varied movements are drawn strongly or explored fully enough to yield more than vague connections. The film makes a convincing argument that, in spite of some recent setbacks, movements for democratic change are alive and well, but it glosses over the problems that arise once the people have to implement the power they’ve seized.